Hagerstown, MD - MiLB.com named former Hagerstown Suns outfielder Juan Soto as one of the Class-A Players of the Month on Thursday along with Yennsy Diaz of the Lansing Lugnuts (Midwest League). The award is from his time at Historic Municipal Stadium in April and will be presented to Soto in Potomac, where he's already played eight games. "Despite an April 23 promotion to Class-A Advanced Potomac, Hagerstown Suns (Nationals) outfielder Juan Soto led the South Atlantic League in average (.373), RBI (24), on-base percentage (.486), slugging percentage (.814) and OPS (1.300)." MiLB's official release said. "Soto, who walked more times (14) than he struck out (13), finished second in the league in extra-base hits (13) and fourth in total bases (48). Soto, 19, was signed by Washington out of Santo Domingo, Dominican Republic, on July 2, 2015." Soto, MLB.com's #28 overall prospect, was named SAL Player of the Week for April 5-15 and also made MLB Pipeline's Prospect Team of the Week twice. As of May 3, he still leads the SAL in RBIs despite having left 10 days prior. In his eight games since being promoted to Potomac, he's batting .344 with two homers and seven RBIs with eight walks to two strikeouts. The 19-year-old played in 23 games for Hagerstown in 2017 before injuries shortened his season. He impressed during his time at Municipal Stadium by batting .360 with three home runs and 14 RBIs. Soto was the first Suns player to be promoted in the 2018 season. The Suns return home to Historic Municipal Stadium for a seven-game home stand beginning on May 9, as Hagerstown faces the West Virginia Power for the first time in 2018. 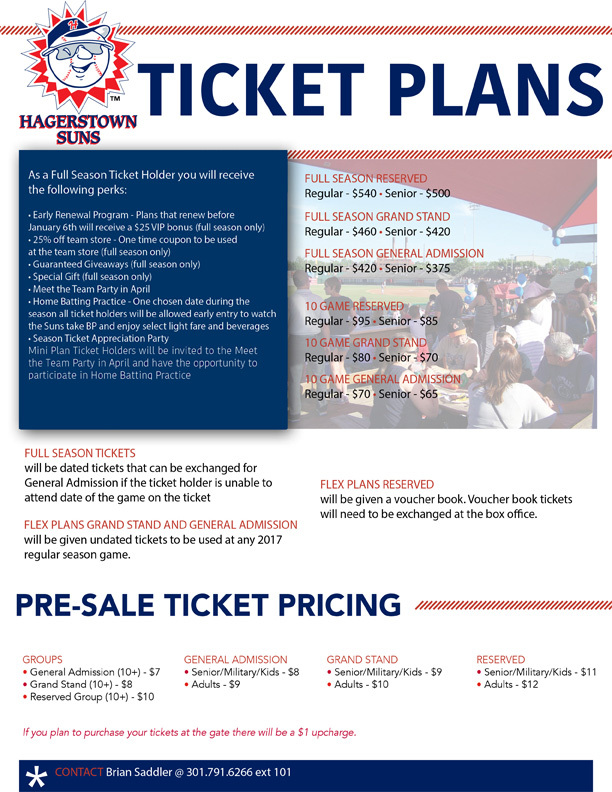 Seats are still available and fans can purchase their tickets or learn more about the Suns ticket plans and promotions for the 2018 season by calling 301-791-6266 or visiting www.hagerstownsuns.com.